This post is directly pulled from the Food and Water Watch blog. 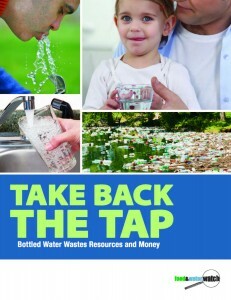 The FWW has written a report on the ways that bottled water wastes resources and money: read the original report here. Americans have bought into the myth that bottled water is purer and healthier than tap water. This misconception is largely the result of crafty marketing tactics from the bottled water industry, but the truth is that the federal government requires more rigorous safety monitoring of municipal tap water than it does of bottled water. For this first time in years, total U.S. bottled water sales fell during the economic recession. During this time, more-expensive brand names struggled while cheaper private label water — store brands — experienced an increase in sales. This competition led Nestlé, among other companies, to reduce the price of its bottled water, to use advertising methods that tout purity6 and to target both people in emerging markets and minority groups in the United States that have limited access to safe drinking water. Between 2007 and 2012, Nestlé’s bottled water sales fell in the United States, Canada and Europe but boomed by 73 percent in other regions. A survey published in a journal of the American Medical Association found that African-American and Latino parents dish out more money on bottled water than non-Latino white parents. The survey found that this is largely because Latino and African-American parents were more likely to believe that bottled water was safer than tap water. What some people may be unaware of is that almost half of the bottled water sold today comes from municipal tap water supplies. When bottlers are not selling municipal water, they are pumping and selling common water resources that belong to the public. These pumping operations can harm the environment and natural resources that communities rely on. Just kicking the bottle in favor of the tap is not enough. Our public drinking water systems need renewed federal commitment, but instead we are decreasing federal funding for our essential water and sewer systems. The federal government’s contribution to water infrastructure improvements dropped from more than 60 percent in 1977 to less than 7 percent in 2007. After receiving a boost in 2010, federal support for water and sewer systems continued to decline in 2011 and 2012. A Clean Water Trust Fund would provide a dedicated source of federal funding so that communities across the United States can keep their water clean, safe and affordable, and the U.S. Congress should pass legislation declaring water a universal human right. Read the entire report from the Food and Water Watch here.